Are Your Mailings Compliant with New USPS Regulations? New Tabber Produces Compliant, Securely Tabbed Pieces, in a Single Pass! The T-650 Inline Tabber is quite simply the most advanced tabber on the planet. It can do something no other table top tabber on the market can do – apply tabs to the top and side simultaneously. It is a purpose-built machine designed to tackle any USPS regulation in force or in the works. Booklet tabbing has become a difficult task with today’s rules. Mailers are scrambling to find solutions that will satisfy tabbing regulations without doubling the time or cost to produce, until now! Two Heads Are More Compliant Than One! 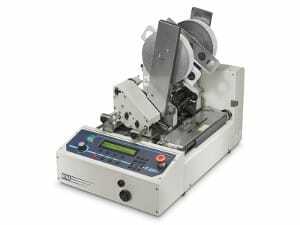 The T-650 features one fixed head that can apply tabs along an open edge, or even apply USPS stamps. The second tab head can switch from ‘side tabbing’ to ‘crash’ (or front) tabbing in a matter of seconds, and with crisp tab wraps every time. The T-650 applies clear, translucent or paper tabs within a variety of tab sizes and can apply the new 1.5″ tabs for letter-size booklets. The T-650 uses tab rolls to keep jobs running longer with 9″ diameter rolls, up to 11,000 tabs! The T-650 from Rena has an efficient footprint, but its heavy-duty aluminum and steel construction will give you years of reliable high-performance use. The amazing T-650 Multi-Side Tabber/Stamp Affixer will make your job easier, and be more productive, profitable & efficient. APPLY 1. 5” TABS SIDE -TO- SIDE OR TOP -TO- SIDE WITH ONE VERSATILE AND AFFORDABLE UNIT. OPERATES AT SPEEDS UP TO 25,000/HR FOR ULTIMATE PRODUCTIVITY. APPLIES USPS PRESSURE SENSITIVE ROLL STAMPS FOR A PROFESSIONAL LOOK. UNIQUE DESIGN CAN SWITCH FROM CRASH TABBING TO SIDE TABBING IN SECONDS. T- 250: TRANSLUCENT & PAPER TABS , UP TO 1.5” IN SIZE, 12,000P/HR. ACCUFAST KT 1.5: USES PLAIN CIRCULAR OR RECTANGULAR TABS EITHER OPAQUE OR WHITE; 1/4” MATERIAL THICKNESS; 15,000 P/H R.
For more information contact All For Mailers, Inc.